At the time I rode with Derek Bell at Le Mans I was uncertain about whether it was in a 956 or 962 Porsche. Both models are visually very similar and were present at the 1985 Le Mans. New-Man Joest Racing, the eventual winners, had 956s. Rothmans, the factory team for whom Bell was driving, were shown on the entry lists with 962s. So I assumed my ride, the T car #111, must be a 962. A few days ago while researching another photograph I came across an amazing website http://www.racingsportscars.com/. They state: “A primary focus is to create a huge photo archive containing all major national and international sports car races and to collect views of every single car in the field.” It is a fantastic effort and resource. On the 1985 Le Mans page I found the record of car #111 with its data. It was a Porsche 956 chassis 009, a T car driven only in practice by Hans-Joachim Stuck, Derek Bell, Vern Schuppan and Al Holbert. Its best lap was 3:19.720 (the best Rothmans 962 had a 3:14.800). Now I finally have confirmation I was in a 956 and with its chassis number I was able to determine the car was a real warrior with one the best records of all the 956s. With Derek Bell and Stefan Bellof driving, 956-009 won seven World Championship 1000 Kilometers races and the title for Stefan Bellof in 1984. I am awestruck I rode in his Championship winning car. 956.009 finished well in several other races and eventually was shipped as a T car to four more. According to the 962.com registry 009 was acquired in 2004 by a Porsche Dealership in Reading England. I knew none of these details until two days ago. I thought the ride was amazing enough and now I am astounded to learn I was in a racecar with such an important history. My posts have now been updated changing 962 to 956. 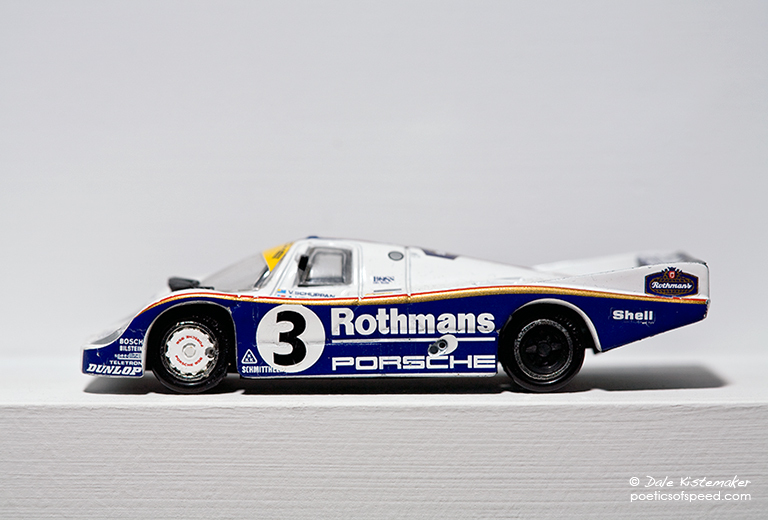 This photograph is of a model Porsche 956 I bought at Le Mans in 1985 right after my ride. For 26 years I’ve always had it nearby. Its currently sitting on a little shelf in my studio about 10 feet away from where I’m writing.